In the 1970s, the American Dream captured the imagination of Africans looking for a better life, but for many today China is viewed as the land of opportunity. We are bringing you stories of Africans – their struggles and successes - as they chase their Chinese Dream from July 17th to 20th, 2012. My name is Luc Bendza from Gabon and I’m in China for more than 30 years…my speciality is martial arts, Wushu and I am …also the coordinator for China Africa Association, Exchange Culture and Business Association. When I was a child in Gabon we watched Bruce Lee movies a lot of movies about flying you know flying east flying west, all over you know. 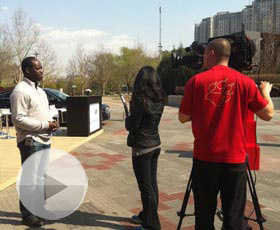 Yahaya: I never thought I would come to China to see very beautiful and kind of a bit organized city like this. My name is Hanza Ibrahim Yahaya, I’m from Nigeria. I’m a student in China and a businessman at the same time. Before I came to China, I never thought I would come to China to see very beautiful and kind of a bit organized city like this. Awa: I was interested in medicine. My dream is to go back home and help people who cannot afford health care with Chinese medicine. My name is Mame Awa Ly Fall, Mrs Sall, I am from Senegal and I am in China to study Chinese medicine. I am studying both in Chinese and in English but we use more English than Chinese. Maria: I was the first black foreigner to do the Bian Lian in the world. It´s really my destiny. In Chinese is "Yuan Fen". My name is Maria. I’m from Africa, Sierra Leon. I’m anartist. My Chinese dream is like having the Chinese culture and African culture and bring it all over the world. If you go to any country, if you want to make it you have to mingle, you have to try to adjust to that system.